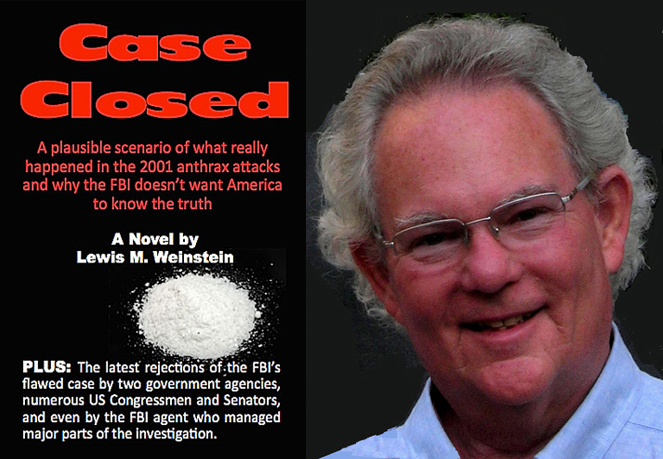 * CASE CLOSED – Lew’s novel about the anthrax attacks and the failed FBI investigation – has been re-published. In this interview, Lew explains why perhaps his novel is closer to the truth than anything the FBI is asserting. « CASE CLOSED … what really happened in the 2001 anthrax attacks? This entry was posted on July 24, 2015 at 9:39 am	and is filed under Uncategorized. Tagged: ** CASE CLOSED by Lew Weinstein, *** 2001 anthrax attacks, *** Amerithrax, *** Dr. Bruce Ivins, *** FBI anthrax investigation. You can follow any responses to this entry through the RSS 2.0 feed. You can skip to the end and leave a response. Pinging is currently not allowed. The book’s main character is Martin Riker, a former US Army officer and expert at the Centers for Disease Control and Prevention, is called out of retirement after a Syrian man who recently came to the States dies of the smallpox virus. The doctor soon learns that a group of terrorists plans to spread the virus to readers of the New York Times by adding strains of the virus to ink at the printing press. There’s also a little love story wound in for Riker, whose beau considers moving to sunny Naples by the end, Norins said. Norins got the idea for the book back in the late ’90s when he read the true story of a Russian defector who revealed his country’s WWII plans for biological warfare including smallpox. That got Norins thinking about the ramifications in a society that has largely dismissed smallpox as a concern. Comment: I read all these articles about terrorism but never see the acts as a useful strategy or tactic. And under the belief system of jihadists, use of smallpox would cause the jihadist to lose their soul. Reblogged this on Lew's AUTHOR BLOG.